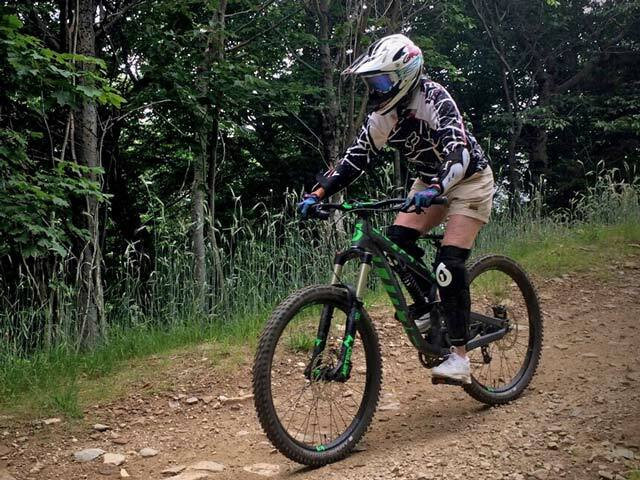 Killington offers mountain biking trails for all ability levels. Mary mountain biking at Snowshed on Easy Street. Cycling, both on and off road, is an excellent way to explore the Vermont country side. Whether you are interested in a comfortable bike tour, the heart pumping exercise of a mountain climb, or the adrenaline rush of hurtling down a mountain trail on a mountain bike, the diversity of terrain near the Birch Ridge Inn will suit your style. You can bring your own bike to Birch Ridge, or rent equipment from one of the many area bike shops. No matter what you choose, you are in for a great day of adventure in the Green Mountains. Mountain Bikers have lots to choose from at the Birch Ridge Inn. Off road terrain for mountain biking can be found on many trails within the Green Mountain Forest System. CCC trails and logging roads criss cross the forest near Woodward Reservoir and Echo Lake adjacent to Route 100. There are a multitude of single track and back road riding trails in the Calvin Coolidge State Forest in the nearby Plymouth Historic District. Rutland Vermont's Pine Hill Park is dedicated to being outdoors with 16 miles of single track mountain biking trails spread out over 325 acres. In addition, there are a number of paths and dirt roads which follow the Ottauquechee river through Sherburne, Bridgewater and Woodstock. And then there is Killington! If you thought skiing down a mountain was fun, try a mountain bike in summer. You will find mountain biking adventures for all skill levels at Killington in the summertime. Vermont is one of the best places to go bicycle touring. The many winding back country roads, small villages, white picket fences, covered bridges, meandering rivers, brooks, and deep blue lakes create a visual feast for the touring cyclist. From Birch Ridge you have easy access to bike touring through out the region. Whether cycling along Vermont Route 100 past Echo Lake, or riding along the Ottauquechee River, opportunities to explore quaint villages and the quiet country side abound. One of Mary and Bill's favorite bike tours is an 18 mile tour called the Salt Ash Loop. This tour travels past both the Calvin Coolidge birth place and the Long Trail Ale brewery (guess which one Bill likes to visit?). It is an interesting ride through the Vermont country side. No matter what type of biking adventure you are looking for, you will find it in Vermont. And all of Vermont is easily in your reach, at the Birch Ridge Inn.